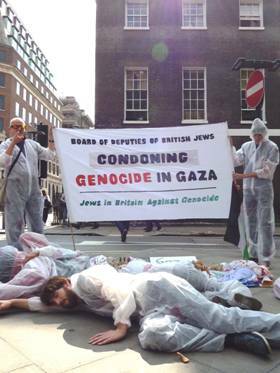 At 3.30pm today, on the 4 August 2014, outside the London offices of the Board of Deputies of British Jews, on the 27th day of Israel’s military attack on the Gazan people, Jews in Britain Against Genocide staged a die-in to commemorate the hundreds of Palestinian children deliberately targeted and killed by Israel. We displayed toys, clothes and replicas of mutilated children and babies smeared red to symbolise the blood of Palestinian children murdered by Israeli forces. We are Jews in Britain outraged at the Board of Deputies’ uncritical support for Israel as it commits genocide against the Palestinian people in Gaza. The Board of Deputies claims to speak in our name when it lobbies in defence of Israeli violence. It organises rallies with the Zionist Federation in support of Israel’s slaughter. It demands that John Prescott be punished for comparing Gaza to a concentration camp (Daily Mirror, 26 July 2014). It attempts to intimidate local councils for flying the Palestinian flag as an expression of solidarity with Gaza, and has written to the prime minister thanking him for his support for Israel’s massacre in Gaza. It cynically uses the Nazi genocide of Jews to silence critics of the Israeli genocide of Palestinians. We Jews know, from our history, about persecution, concentration camps, starvation and murder. Israel has turned the Gaza Strip into a concentration camp by imposing a seven-year military siege, by restricting access to food, water, fuel and medical supplies, by imprisoning 1.8 million people and squeezing them even further by imposing no-go areas within the Gaza Strip. In the current assault on Gaza, entire families are killed and neighbourhoods obliterated. UNICEF has condemned Israel for deliberately targeting women and children. Nearly 400 children have been murdered in less than four weeks, and more than 2000 have been injured and maimed. Gaza’s dead children are dead simply because they are Palestinians – this is genocide. At least a quarter of a million Gazans are homeless because of Israeli bombing. There is nowhere safe to escape to — Israel has bombed UN-protected schools, hospitals and other UN buildings, killing civilians seeking refuge. Ten thousand people have been killed or injured. The bombardment of Gaza from the sea, land and air increasingly turns Gaza from a concentration camp into a death camp. We support the Palestinian call for boycott, divestment and sanctions (BDS) and in particular we demand that the British government end its complicity in genocide by first of all ending its arms trade with Israel. The Board of Deputies claims it wants Israel to be treated fairly and impartially within British society, but in fact it demands exceptionalism. It wants Israel to be exempted from any sanctions in spite of its apartheid and now its genocidal campaign against Gaza. We accuse the Board of Deputies of condoning the atrocities the State of Israel commits in Gaza by attempting to silence Israel’s critics. This massive blood stain will not go away. We accuse the Board of Deputies of joining with the anti-Semites in equating Zionism with Judaism and telling the world that all British Jews support Israel. That is a lie. This entry was posted in National News and tagged Jews in Britain Against Genocide, UNICEF has condemned Israel for deliberately targeting women and children, hundreds of Palestinian children deliberately targeted and killed by Israel.. Bookmark the permalink. 1 Response to The Board of Deputies of British Jews is condoning genocide in Gaza. They don’t represent us. The 4th Geneva Convention does not apply to Gaza or the West Bank since at the time of ratification neither territory was under the jurisdiction of any state at the time. I am sure you are aware that Gaza was originally under control by Egypt while the West Bank was under Jordan’s control in which both at one point were invaded and occupied by IDF since the territories were used as platforms to launch attacks against Israel by Muslim states. Israel considers itself an authority in Gaza and West Bank as which is granted to an occupying power, is allowed and specified under the 4th Geneva Convention as well. In terms of the Six Day War that was not started by Israel but started by her neighbors. Prior to the conflict Israel was victim from attacks by terrorists it was discovered were being allowed to migrate through Syria. Egypt at first sent troops to the Sinai Peninsula due to an, admittedly, flase report that Israel was going to invade Jordan. Egypt later closed the Straits of Tiran considered an international water way at the time. Egypt then joined in the engagement due to a pact the country had with Jordan and Syria in which all 3 countries had military agreements with each other. Israel did start the fighting with an airstrike but the aggressions that lead up to the war were initiated by her Muslim neighbors. The reason for a lack of self determination by Gaza and West Bank Palestinians is simple, if they stop supporting terrorists and recognize Israel’s right to exist then the violence will stop. The Muslims not only refuse to but even reject any agreement geared to bringing peace to the region.To begin with I suggest you look up a man named Muhammad Amin al-Husseini. He was Yasser Arafat’s uncle and a Muslim cleric who ended up migrating to Germany and got a personal audience with Adolf Hitler. Husseini helped Hitler implement his Final Solution as well as raise Muslim regiments for the Nazis. When Nazi Germany fell he continued his activities helping to create groups like the PLO and Young Egypt Party which was a pro-Nazi organization. Among Young Egypt’s members were future Egyptian Presidents Gamal Abdel Nasser and Anwar Sadat. Nazism did not die with the defeat of Hitler but migrated to the Middle East thanks to Husseini in which you see Nazi influences in groups like Hamas, the Muslim Brotherhood (whose founder Hasan al-Banna was a Nazi sympathizer) and Hizbullah.